A more useful and inviting wishlist for The Iconic, plus I transformed it into a social network. After studying Stanford professor BJ Fogg’s model of behaviour and the Hook model by entrepreneur Nir Eyal, I attempted to implement these models into the The Iconic’s current approach to user experience. The immediate thing I noticed was that the Iconic’s website and apps were severely lacking in the 4th step of the Hook. Investment. That being The Iconic wasn’t giving the user much chance to invest emotion, time, effort, etc into the experience, which would thus increase their chance of returning. Instagram gave me some inspiration, having started with a photography app that targeted amateur photographers who had the motivation of “wanting to capture the moment” but of whom many now stay for the social network (an excellent example of investment). 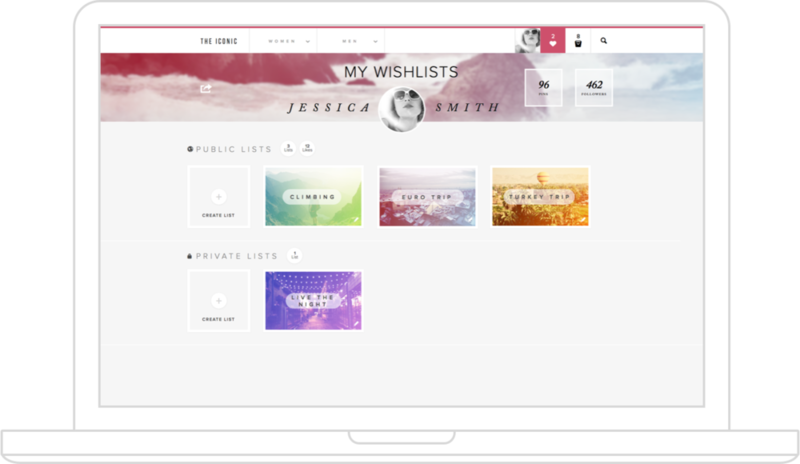 I added two key features of The Iconic wishlist, which made the transition to a fashion oriented Pinterest clone, easy. First, allow the user to create sub-lists, so they can organise the items they’ve added to the wishlist, according to their purpose. Then, simply let the user create public wishlists as well as private ones. Thus opening up the possibility of letting users interact with each other’s wishlists. Allowing them to comment, favourite and most importantly follow, thus- giving users a whole new addictive reason to immerse themselves in The Iconic’s products.